The majestic Lake Arenal near the famous Arenal Volcano is the largest lake in Costa Rica. Clean, clear, pristine and with an average water temperature of 72 degrees year round, it is the ideal environment for kayaking, swimming, windsurfing, kiteboarding, fishing for rainbow bass and South American bass, and boat tours. There is also a boat shortcut to the Monteverde Cloud Forest, with an option to do part of the trip on horseback and/or jeep. 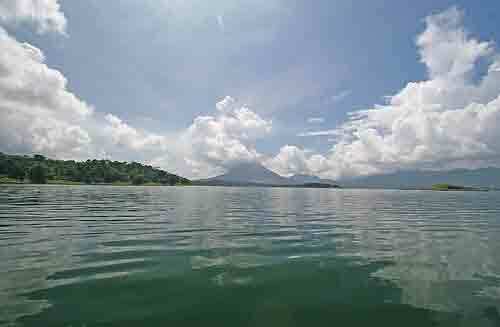 Lake Arenal was enlarged to 3 times its original size to form a basin for the hydroelectric project that now produces 70% of Costa Rica's electricity. With a total area of 85.5 km (33 sq. miles), the lake is surrounded by rolling hills that are partly pastured and partly forested and dominated on the east side by the imposing perfect cone of Volcan Arenal. Lake Arenal, with its unique combination of warm fresh water, steady and strong winds and spectacular scenery, now enjoys a world class reputation amongst windsurfers and sailboarders. The lake is surrounded by rolling hills and pastures, perfect for hiking amongst the varied flora and fauna. The area is also an ideal vantage point for watching birds such as parrots, hummingbirds and toucans, as well as howler and white faced monkeys and coatis. This natural wonderland has spectacular waterfalls and ancient caves to explore on foot or on horseback. And to complete your unforgettable vacation, treat yourself to a soak and a meal at the nearby Tabacon Hot Springs and Spa or the Eco Termales Hot Springs.